The Golden Dawn by Gwyllm Llwydd; you can get you own copy of this beautiful artwork here. Established in 1888, the Hermetic Order of the Golden Dawn is one of the most important esoteric groups of the modern age. Its influence on today’s theurgic groups has been immense. The Order is rightly credited with, and sometimes criticized for, bringing together many strands of esoteric wisdom from a variety of traditions and weaving from them a coherent and effective system of spiritual development. Many modern spiritual groups continue to work the rituals and exercises originally created by the magicians of the Golden Dawn, sometimes unaware of their provenance. 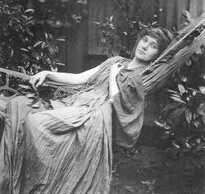 Doreen Valiente, a leader in the modern revival of witchcraft, cited the Golden Dawn material as the best way for witches to learn and understand magical technique. Yet the Order has received scant recognition for the important part it played in the “return of the Goddess” that continues unabated in much of the developed world today. 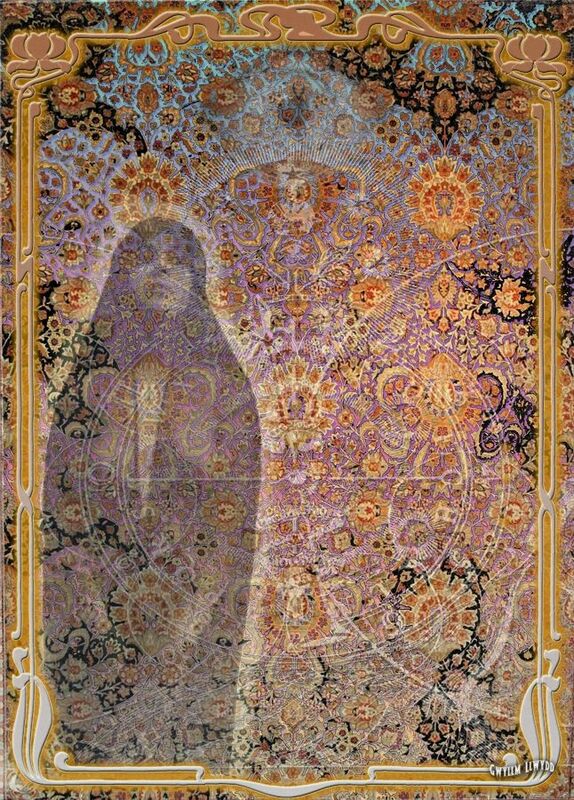 In the Golden Dawn’s understanding of the Divine, the Feminine Divine is essential and equal. More than a hundred years ago, the GD honored the Goddess by insisting that women and men be admitted “on a perfect equality”. 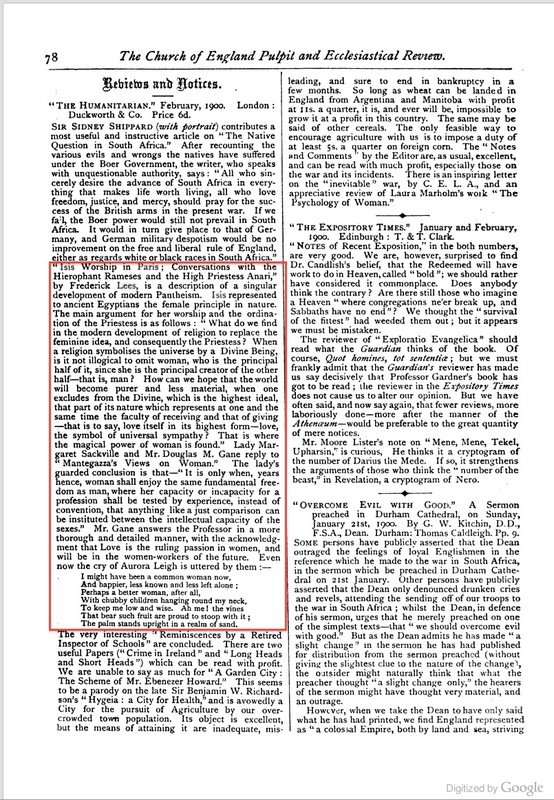 In a paper on the history of the Order, William Wynn Westcott, a co-founder, explained women’s inclusion in the Order in part due to the importance of women in the Ancient Mysteries, “notably those of Isis”. It is easy to see why suffragettes and New Women, part of the first wave of modern feminism, were among the Order’s members. There was, however, a particular Goddess Who particularly inspired two of the Order’s most important members. As you no doubt suspect by now, that Goddess is Isis. The members are MacGregor and Moina Mathers, founding members of the Order. For this post, however, we’ll focus on the Mathers’ personal Work with Isis; and it was personal for they were true devotees and worshippers of the Goddess. What’s more, the Mathers were Isiac evangelists. By the turn of the 20th century, they were living in Paris and publicly performing Isis rites for the avowed purpose of “resurrecting” the worship of Isis and attempting to share the “beautiful truths” they discovered during their study of the religion of Isis, which for Egyptologists was long dead, but was for them “full of life and vital forces.” They believed that the revival of the Isis religion would be a great force for good in the world. 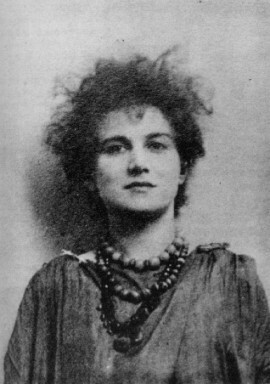 Moina Mathers, circa 1895; if that date is correct, she would have been about 30. Best photo ever! At first, however, their worship of Isis was private. As so many of us do, they had a private temple in their residence. 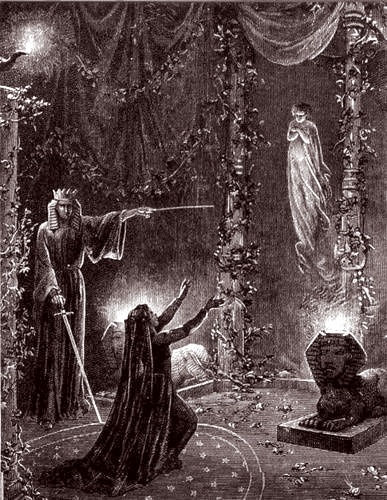 In an interview about the public rites, MacGregor and Moina said that they began their “Isis Movement” when Jules Bois, a journalist familiar with the Parisian occult scene, asked them to perform a public Isis ceremony at the Bodinière Theatre, a small Paris theatre that could be hired for lectures and performances. At first, they refused, but then Moina had a dream in which Isis gave Her permission for the public ceremony, so they proceeded. 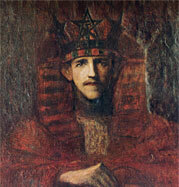 Moina’s famous portrait of her husband in his GD regalia; MacGregor met Moina in the British Museum as she was sketching Egyptian antiquities. Egypt had long been a passion for both. A magical ceremony as imagined in an illustration of about this period; some have thought that it was supposed to be MacGregor and Moina in their Isis Rites, but I don’t think so. I’ve also seen it called “Necromancy” and I’m thinking that might be more like it given the ghostly look of the floating being between the Pillars. The High Priestess Anari holds some very interesting opinions on woman’s role in religion. Although it all seems a bit stereotypical now, it was pretty strong stuff in its day. Strangely enough, a summary of the Lees article—noting this topic in particular—found its way into the Church of England Pulpit and Ecclesiastical Review, a source of sermon ideas for clergy. Even more strangely, it was presented positively, which just goes to show how the times, they was a changin’. There is yet more that we can know about the Mathers’ Parisian Isis work. But we’ll save that for next time as this post is quite long enough for today. Next week, a pretty wild account of one of the ceremonies as well as images of the Mathers as Ramses and Anari. Thank you for yet another interesting article on the Goddess. So much information I have never come across before. I love the way they met each other 🙂 Thank you for your well-researched and lovely article. This article and an interview with MacGregor Mathers are found in _Women of the Golden Dawn: Rebels and Priestesses_. Thank you, Mary, for that…and for your wonderful book as well 😉 So nice to hear from you!